Which cities would you choose for a French trip? Paris must head the list, followed by Nice on the French Riviera, neither of which would come as a shock. But how about the others? This list of the most popular cities might surprise you...in alphabetical order with one exception. Paris is the most popular French city, so we have to start there. ​Paris is one of the world’s most romantic and beautiful capital cities and with a population of around 2,250 is by far the largest city in France. Its iconic buildings are known the world over: The soaring Eiffel Tower, Notre-Dame Cathedral, the famous Latin Quarter on the Left Bank, the Champs-Elysées, and Montmartre. The capital's museums are among the best in the world, with the Louvre leading the way. And don’t forget the Centre Pompidou with its exciting contemporary art exhibitions, the fabulous collections of Impressionists and Post-Impressionists in the Musée d’Orsay, converted from a former railway station, and the less well known but superb Cluny Museum where medieval treasures like the 15th-century Lady and the Unicorn Tapestry are to be discovered. Then there are the small quartiers with their street markets and restaurants and bars where the locals hang out. Paris may be the capital but France is very regionally minded, and for a true taste of the country you need to explore other regions and cities. If you’re staying in Paris, make time for some visits to nearby attractions, like Fontainebleau, Vaux le Vicomte which was the inspiration for much of Versaille, and Alexandre Dumas’ Chateau de Monte Christo. The old capital of Provence is one of the south of France’s most charming cities. It has everything you would expect: architecture that takes you back to the 17th and 18th centuries, elegant patrician houses, and long tree-lined avenues where bubbling fountains keep the summer temperature cool. Old Aix is a great place to stroll through, centered around the famous Cours Mirabeau where the plane trees meet over the avenue lined with cafés and restaurants that spill out onto the pavements. Artists and writers who flocked to Aix met at the Café des Deux Garçons at no. 53. The cathedral St-Sauveur, the Quartier Mazarin, the Fondation Vasarely, and the Tapestry Museum are good places to step into. Then sit in a café or restaurant surrounded by locals and the students that make Aix such a lively city. The final great bonus is the famous open-air markets that fill the streets daily. Above all, Aix is the city of Paul Cézanne who was born and lived here. You can follow his life in Aix, then drive out to La Ste-Victoire, the mountain that the artist painted 60 times. Nearby cities include Marseille (25 km), Avignon, and Nîmes. Amiens is best known for its cathedral; visit if you can during the summer months when the son-et-lumière (sound and light show) dances over the magnificent façade of the largest Gothic cathedral in France. Amiens has surprisingly attractive parts. The Quartier St-Leu just north of the cathedral is crisscrossed with canals and small houses of past textile workers. Once run-down, this is the place for the waterside bars and restaurants that make up some of Amiens' lively nightlife. And it’s the canals that water the strange hortillonnages (market gardens). It’s well worth taking a boat on a quiet trip through the blossoms of the fruit trees and fertile plots of land, still providing the locals with their fruit and veg. For culture, there’s the excellent Musée de Picardie with its huge Puvis de Chavannes paintings on the walls of the main stairwell, and a room, surprisingly, created by Sol le Witt. No wonder Amiens attracted Jules Verne who lived here for most of his life and died here in 1905. Fans visit his house, full of memorabilia and objects belonging to the writer. For families, there’s the theme park, Samara, showing how our distant ancestors lived in prehistoric times in north Europe. And finally, there’s a great Christmas market here as well as two enormous annual flea markets, one around Easter and the second on the first Sunday in October. It’s another place for a good short break from either Paris or London. Nearby cities include medieval Arras, with its 2 major attractions, the World War I Wellington Quarry which dramatically and effectively shows how British and Canadian soldiers quarried under the town to attack the nearby German lines, and the British World War I Memorial in Arras. Once the Roman capital, then a religious center in the Middle Ages, Arles has a fascinating history. Its importance began when Julius Caesar took Marseille in 49 BC and Arles became commercially important, standing at a crossroads of major routes as well as providing a major port. Its great antique glory was the Roman Theater, built between 27-25 BC. There’s little left of the huge theater which could seat 12,000 people but it’s an impressive ruin. The other great Roman edifice is Les Arènes, an amphitheater of the 1st century with a capacity for 20,000 spectators, with cages for the animals and a huge backstage area. You can walk through the upper levels and watch bullfighting and opera from the tiered seats. The UNESCO World Heritage Site is in the Camargue, where cowboys on white horses round up the bulls in the strange marshy flatlands. Arles is near Avignon, Nimes, and Montpellier. It's also very near the strange city of Aigues-Mortes, built as a fortress port by Louis IX in the 13th century as a jumping off point for his departure on the Seventh Crusade, and still with its massive fortifications and towers. There's another great attraction to the north of Arles, the Carrières de Lumières near Les Baux-de-Provence, vast limestone quarries housing over large reproductions of the great Impressionist artists. In the Middle Ages, Arles was one of the major starting points for a pilgrimage to Compostela in Spain. Stretching along the left back of the river Rhône, Avignon is regarded as the center of Provence where religion played a dramatic part and art flourished. Today it’s a beautiful, theatrical city with a lively arts scene and a famous annual Arts festival in July and August that recalls medieval pageants and uses the city’s splendid backdrop as its stage. A walled city with ramparts still standing, Avignon is best known for the huge Palais des Papes, built by the schismatic popes who started with Clement V, moving their headquarters from Rome to Avignon. From 1309 to 1377 seven French popes held power here. The Palace is a vast fortress of two buildings with audience rooms, courtyards, a treasury, banqueting hall and bedchambers displaying the wealth, power and love of comfort of those long-dead spiritual leaders. The other great site is the Pont d'Avignon, or Pont St-Bénézet, which stretches out into the river but doesn’t reach the opposite bank. There are museums for every taste, from the Museée du Petit Palais with a major collection of Italian paintings from the 13th to the 16th centuries to the decorative arts at the Musée Louis-Vouland; some great restaurants serving Provence cuisine, cafés with shaded outdoor terraces to pass the time of day and bars for a great nightlife. Once the Monte Carlo of the Atlantic coast of France, Biarritz’s bright star faded in the 1960s as the Côte d’Azur resorts took over as the places to see and be seen in. Biarritz came to the fore in the mid-19th-century, created by Napoleon III as the most fashionable resort in France. Much remains of the old city and the gracious mansions, the halles, the place de l’Atalye, and the old port are the focus of today’s visitors. It was the French who first rediscovered the resort with its fabulous surf, along with chic Parisians who in the last few years, have made the French Atlantic coast a far more desirable place to visit than its rival to the east. For anybody interested in the ocean, the Musée de la Mer with its collection of weird tropical fish, sharks, and stingrays from all the world’s great oceans is a must. It’s one of Europe’s greatest aquarium collections with the fish swimming in tanks made as near as possible to their natural habitats. Between Biarritz and Bordeaux, you'll find some great beaches, including some of the best naturist resorts. On the banks of the mighty river Garonne, Bordeaux is a grand city, important during the Roman occupation and today recognized as a UNESCO World Heritage Site. The city was for three centuries under English rule, the result of the marriage of Eleanor of Aquitaine to Henry Plantagenet who became Henry II. So it's not surprising that Bordeaux has always attracted the British. Its seafaring tradition was consolidated with the English demand for wine from the surrounding vineyards (many of them still British-owned). Today Bordeaux is a gracious, neo-classical city, created by the French in the 18th century. It’s had a huge restoration project turning the 18th-century buildings along the quays and in the old town back to their original glorious ochre color. Bordeaux is one of France’s most attractive cities to visit, with a superb Grand Theater, old neighborhoods, a cathedral, and good museums like the newly reopened Musée des Beaux Arts, and the hugely enjoyable Musée d’Aquitaine. Sample great food in the restaurants, sit in the pavement terrace cafes and head out to the famous Bordeaux wine region. Between Bordeaux and Biarritz you'll find some great beaches, including some of the best naturist resorts. Lille, which is Northern France’s largest city with around 234,000 inhabitants, is popular for weekend breaks both from London and from Paris, particularly at Christmas when its Christmas Market fills the streets. Once a great Flemish city, Lille keeps some of the grandeur of the past with its elegant ancienne bourse (old stock exchange), winding cobbled lanes and streets and old red brick houses. It was the city where Charles de Gaulle was born in 1890 and his house is full of mementos of the great leader, though for the real story of the man you need visit the inspiring Memorial and his home in Colombey-les-Deux-Eglises, between the medieval city of Troyes and Chaumont in Champagne. Artworks looted by Napoleon are on display in the Musée des Beaux-Arts, making it the second museum after the Louvre in Paris, while important contemporary exhibitions are put on at the TriPostal, the old sorting office in the center. Don’t miss the evocative, beautiful Musée de l’Hospice Comtesse, a former hospital full of works of Flemish art in its old rooms. One of the greatest annual events in northern France is the annual braderie or flea market that takes over the whole city for a weekend in September. Lille makes a great center for sightseeing in this part of the world. Don't miss sights include the Louvre-Lens, the outpost of the Louvre in Paris with a stunning display in a contemporary building; La Piscine, a surprising museum and gallery in a former Art Deco swimming pool in nearby Roubaix, and the nearby towns of medieval Arras with its World War I memorials, and Amiens. Lyon in the Rhône valley is the second biggest city in France with nearly 500,000 inhabitants. Once a major trading and industrial city with silk as the main production, today it’s a city with a vibrant buzz, the reputation of a major gourmet destination, exceptional museums and unique attractions like the traboules (secret, covered passageways that lead you hidden through the city), and the great murals painted on its buildings throughout the city. From the remarkable Gallo-Roman museum on the hill of Fourvière (try to be there for the excellent summer arts festival which takes place here in the old Roman arenas), you can see Lyon stretching out below you. The red-tiled roofs crowd the city's roofscape, with the towers of the St-Jean cathedral standing out. It’s a city for walking around, taking in the different areas from the Croix-Rousse, the old silk weavers’ district to the new district which makes up in cultural blockbusters what it lacks with its bland appearance. Here you’ll find the Institute Lumière, the outstanding cinema and film museum housed in the former villa belonging to the Lumière brothers, two of the earliest pioneers of film. Also here is the grim center of the history of the resistance and deportation; this was the city of Klaus Barbie, the 'Butcher of Lyon'. Take a tour through the traboules -- originally built so that the silk weavers could carry their delicate work around the city without damaging them, then used during World War II for Resistance fighters. Try to get to Lyon for the extraordinary Festival of Light in December. It's a number one attraction with fantastic light shows playing across the city's facades and buildings over 3 days and nights. Marseille – to some people still the place of The French Connection; to others a reinvigorated city upping its image, particularly since its role as European City of Culture in 2013. Marseille has always been a vital port for the Mediterranean from its beginnings as a major trading post built by Greeks from Asia Minor. Marseille is both France’s second city and it’s oldest with a bit of everything from Roman remains to the superb new MuCEM, a museum devoted to the cultures of the Mediterranean. And it has two rather more off-beat claims to fame. La Marseillaise, the Revolutionary song was called after the people of Marseille and sung during the storming of the Tuileries. And just off the coast, you come to the famous Château d’If, where the hero in Alexandre Dumas’s The Count of Monte Cristo was falsely imprisoned. Now there's a direct train from London St. Pancras, stopping at Lyon and Avignon before Marseille. It means that without changing trains and taking just over 6 hours, Marseille has become a possible short break city from the UK. Marseille is also near other spectacular places: the delightful Var in Provence, the cities of Aix-en-Provence, Avignon, Nîmes, and Montpellier, and not forgetting the intensely romantic Aigues-Mortes, and the wild marshes, bulls, and cowboys of the Camargue. Montpellier was once a huge trading center, a vital city for merchants from all over Europe as well as the Levant and Near East. Europe’s first medical school was founded here in 1137 and its university students still help make this Mediterranean city one of the liveliest in the south of France. Today it’s the capital of the Languedoc-Roussillon region. Montpellier has a lovely old quarter, centered around the Place de la Comédie with the esplanade Charles-de-Gaulle running off the north end. This is the place to stroll around, sitting in pavement cafés and listening to musicians. There are formal gardens, a cathedral, and the Musée Fabre which displays 17th to 19th-century European paintings by major artists, ceramics and contemporary art. Add to that a huge Saturday flea market and a daily fruit and veg market around the Arc de Triomphe and you’ve got a great city to visit. If you're after sun and sand, Montpellier is near some great Mediterranean beaches, including the delightful resort of Sète. And if you are a naturist or just like to bare all, then the nearby resort of Cap d'Agde is the place to go. Once the capital of Brittany, Nantes is one of those cities that declined then spectacularly reinvented itself in the last decade. Just 2 hours away from Paris by the TGV express train, it’s become the jumping-off point for a coastline that is fast rivaling the Côte d’Azur in the Mediterranean in popularity. But it’s the Machines de L’Ile that have led the revival. Here, on a long island in the Loire in the center of the town, you’ll find not only the fabulous Grand Éléphant who ‘walks’ around carrying passengers, flexing its trunk and spraying water over delighted bystanders, but also a Marine Worlds Carousel that plunges you into a Jules Vernes version of the world. The Castle of the Dukes of Brittany is now an outstanding museum, telling the story of the city’s rise and fall as well as its slave trade. Don’t miss the moving Memorial to the Abolition of Slavery down by the river. There’s a cathedral with an outstanding tomb with marble figures so life-like they send shivers down your spine, and a gracious 19th-century part. Nantes never stands still; the latest project involved placing artworks down the estuary that empties into the Atlantic. Take a cycle ride or a trip and you’ll be amazed and intrigued. From Nantes, it’s a relatively short drive to one of France’s beautiful, and relatively unknown islands, the Isle de Noirmoutier, a delightful island just off the coast, cut off from the mainland twice a day (though you can cross a bridge to get there.) From here, the Vendée coast runs south, offering small villages and lovely resorts, perfect for sailors. The final must-see site in the region is the Puy du Fou theme park, second only to Disney. The Queen of the French Riviera is a glitzy, exciting city with around 348,195 inhabitants, making it France’s 5th largest city. It may be France’s 5th city in terms of population but it's second in popularity. With its gorgeous climate, it’s an all-year-round destination, with one of the world’s most famous carnivals kicking off the annual season of events in the early Spring. The jazz festival in high summer is another major attraction. But it has an illustrious past as well, some of which you can see in Cimiez with its Roman ruins. On the border with Italy, Nice has more of a cosmopolitan, European feel than many of France’s other cities. It’s an easy city to get around, with a great tram system taking you through the main parts. Nice first was put on the map by the English milords who originally included Nice on their 18th-century Grand Tours. But it was the early 20th-century visitors who sealed the resort's popularity, people like Scott Fitzgerald and other Americans who made the Cote d'Azur their playground. Old Nice is the place to start the day with breakfast in the Cours Saleya watching the daily market fill up with the freshest fruit and vegetables. There are plenty of museums and galleries to see, particularly the Musée Marc-Chagall and the Matisse Museum. 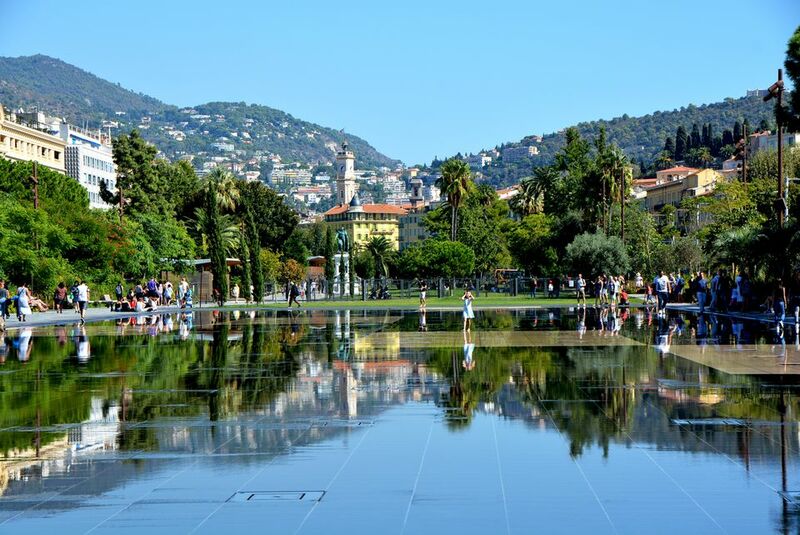 A stroll along the Promenade des Anglais is a must, with the sparkling Mediterranean sea to one side and the grand Belle Epoque buildings lining the streets and the hills behind Nice. It’s a great city to eat in, from the socca at Chez Pipo to the great bistros in the port where you can sit on the terrace watching the yachts bobbing in the water. 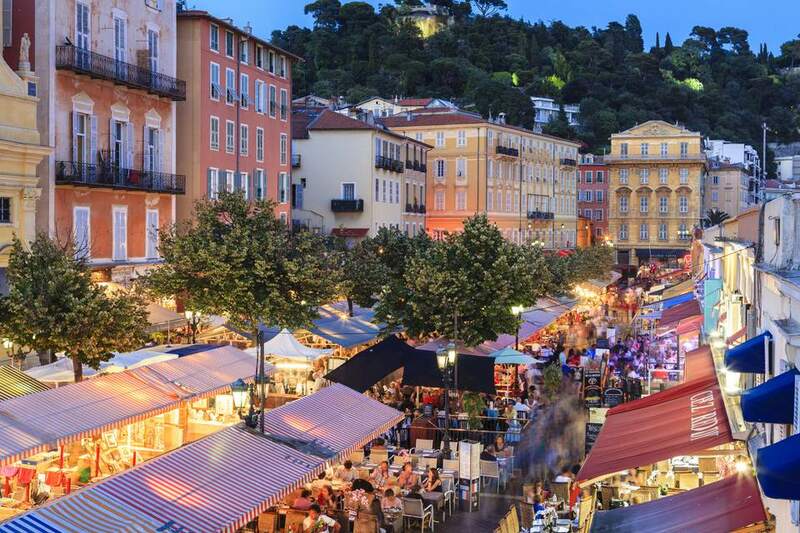 Nice also makes a perfect center for trips to Provence and other cities on the French Riviera. It’s near enough to Antibes via a quick train ride, where the walled old town and marina, the most extensive and expensive in terms of yachts along the coast, offer a good contrast. And it's near enough to Cannes to make staying here a viable alternative during the famous May Cannes Film Festival. Nîmes is one of France’s most spectacular Roman cities – with its 1st-century Roman arena, known as Les Arènes alone making it a number 1 visitor attraction. Add to that the Maison Carrée, the best preserved of all Roman temples dating back to Augustus (1 st century BC) but rebuilt in the 5th century and used by Napoleon for a model for the Madeleine church in Paris; the surviving Roman gateway of Porte d’Auguste, and the famous Pont du Gard, just 12 miles (20 km) northeast of Nîmes, a huge long stretch of the original 31 miles (50 km) long Roman aqueduct. But Nîmes is not all ancient buildings. It has a good Old Town with 17th- and 18th-century mansions (don’t miss the revamped Hôtel de Ville), some great museums including the Musée du Vieux Nîimes in the former bishop’s palace, and the Musée Archéologique, and the Musée d’art Contemporain, housed in the Carré d’Art, a bold, innovative building designed by British architect Norman Foster. Keep in the cool at the Jardin de la Fontaine, France’s first public garden created in 1750. Its other claim to fame is as the place where denim was first manufactured, leading to its name fabric de Nîimes. The northernmost city on the Loire, Orléans is just over 100 km from Paris. To the north lie the rich cornfields of the Beauce while the wild and beautiful Sologne forest lies to the south. Once the capital of France, Orléans is a gracious city with 18th- and 19th-century streets and arcades. It’s most famous as the city of Joan of Arc with the cathedral Sainte-Croix full of reminders of the warrior and stained glass windows telling her story. There’s a good Musée des Beaux Arts, while the Maison de Jeanne d’Arc tells the saint’s story. The riverfront has bars and restaurants where you can sip Loire wines. Orléans makes a good starting point for a tour of the Loire Valley Chateaux, which make the main reason to visit the region. The châteaux are strung along the river like a necklace of precious beads, but the gardens are equally as spectacular. To the east lie such delights at Notre Dame d’Orsan, where you can also spend the night and near Nevers, the spectacular Ainay-le-Viel. To the west, you see Chaumont which has an international garden festival each year as well as lesser-known gardens like the English-style garden at Plessis Sasnières and the gardens around Clos Luce, the house where Leonardo da Vinci spent his last years. Orléans also makes a good stop on the Loire a Velo cycle route that runs 500 miles from the little village of Cuffy in the Cher to the coastal village of St-Brevin-les-Pins on that Atlantic coast. Nearby towns include Blois and its famous château and Chartres with its world-famous spectacular Gothic cathedral to the north. After Barcelona, Perpignan is Catalonia’s second city so you’ll find plenty of Spanish – and North African – influences here. It’s a colorful city and a good place to try out Catalan cuisine which is distinctly different from its French neighbors. There’s plenty of history here too, seen in places such as the 14th-century Le Castellet, the gateway into the city which houses the Casa Pairal showing local Catalan rural culture. The pedestrianized Old Town centers around the Place de la Loge with cafés and brasseries, overlooked by the 14th-century Gothic Loge de Mer, once the city’s stock exchange. South of the Cathedral of St-Jean-Baptiste, you come to the Maghrebian quarter, full of North African shops, a market, and cafes. Walk a little further south to the Palais des Rois de Majorque, a 2-story building reflecting James I of Aragon’s wish to conquer the Kingdom of Majorca. The magnificent Notre-Dame cathedral where French Kings were formerly crowned with its 13th-century stained glass, much reconstructed plus windows by Marc Chagall; the splendid Bishop’s Palace of Tau showing some remarkable treasures; the St-Remi basilica dating from 1007, and museums of great interest including the Musée des Beaux-Arts in a former Abbey and the World War II Musée de la Reddition in a building formerly used by Eisenhower as his headquarters and the place where the German capitulation act was signed in May 1945…How many more reasons does anybody need to include Reims in a tour of France? Well. There’s a great collection of restaurants, including the old, very popular Boulingrin Brasserie, good shopping and of course...the bubbly. Reims along with Epernay is the capital of the Champagne-making region, so try to arrange a visit to a Champagne house like Pommery. Rouen’s Notre-Dame is one of the great Gothic cathedrals of France, dominating this charming city which is near enough to the channel ports of Dieppe, Le Havre, Caen, and Calais to make it a good city break from London. Being just 81 miles (131 km) northwest of Paris, it also attracts visitors wanting a short break from the capital. Famous, or infamous depending on your point of view, for being the place where Joan of Arc was burnt at the stake (on the Place du Vieux-Marché), Rouen also has a rare example of a medieval plague cemetery. You can’t see it but you can see the buildings that surround it showing the Dance of Death. The new Historial Jeanne d'Arc is a multimedia experience taking you back to the Maid of Orleans' time and her story. The old town clusters around the cathedral, its narrow streets lined with timber-framed houses. You can’t miss the grand Gros-Horloge clock on the front of an ancient archway and you mustn’t miss the Musée des Beaux-Arts which has a superb collection of 15th to 20​th-century paintings, including a collection of Impressionist paintings that is second only to the Musée d’Orsay’s in Paris. The Ceramics museum shows the history of Rouen pottery and when you’ve finished here, you can buy modern versions handmade and hand-decorated in some of Rouen’s faience shops. Good hotels and restaurants make Rouen an attractive place. If you're in Rouen, travel on westwards to Caen with its old buildings and major World War I & II memorial, and Bayeux for its magnificent tapestry. You're also near the Normandy D-Day Landing Beaches, so you can add on a tour of the memorable cemeteries and memorials. You won’t regret coming to Strasbourg around Christmas time; the capital of Alsace has one of the best and most extensive Christmas Fairs in France. But there’s plenty to take you to Strasbourg at any time of the year. Strasbourg has both a distinctive historic center which is now a UNESCO World Heritage Site and modern skyscrapers that house the Council of Europe and the European Parliament. It has a magnificent Notre-Dame cathedral built in red Vosges sandstone in the 12th century with a masterpiece of a Gothic spire with 12th to 14th century stained glass windows while the oldest stained glass in existence is displayed in the excellent Musée de l’Oeruvre Notre-Dame (Museum of the Art Works of Notre-Dame). The Palais Rohan, the former Bishop’s Palace is the place for a walk through the France of the fashionable 18th century. The old quarter around the cathedral has what is believed to be the oldest pharmacy in France, the Pharmacie du Cerf existing since 1268; while the area known as Petite France clusters around the river. Once the place where the fishermen, tanners, and millers lived; today it’s the narrow winding streets are full of bars, restaurants, and shops. Toulouse is one of France’s most exciting provincial cities as well as being the main town in western Languedoc. Its rose-red stone gave its name to the old city; the Ville Rose rises up from the Garonne river while the Canal Du Midi flows majestically through the northern part. The city centers around the Place du Capitole, just the place for people watching from the pavement terraces. A huge market takes over the center on Wednesdays; while one side of the square is taken up with the Capitole, the building of the city government. Museums fill the gracious buildings; there are plenty of old churches, including the Basilica of St-Sernin, begun in 1080 to accommodate the pilgrims flocking to Santiago in Spain, and the Jacobin church, the first church of the Preaching Friars who helped fight the Cathar heresy. But Toulouse is not wedded to the past. Space and exploration are celebrated at the ​Cité de l’Espace where you can walk inside a Mir space station mock-up. To the west of the city, you can visit Aérospatiale’s Usine Clément Ader, the high tech factory where Airbus passenger jets are assembled, including the gigantic A380 Airbus. Toulouse makes a great center for visits in southwest France. Try to visit Albi with its astonishing cathedral and great Toulouse-Lautrec Museum.